It has been postulated that inflammation caused by certain viruses might result in cancer. Recently, it was shown that childhood lymphoblastic leukemia, breast and ovarian cancers express an interferon-related signature, providing support for this notion. We have previously shown that 38% of the sporadic breast cancers contain MMTV-like env gene sequences. To find out if the presence and expression of MMTV-like sequences correlated with an inflammatory phenotype, we have compared the expression profile of two sublines of MCF-7 cells, one containing the MMTV-like sequences (env+), the other one lacking them (env-). The results indicated that there were 47 differentially expressed genes between the two sublines. Among 27 upregulated genes in the env+ cells there were 7 interferon-related genes, 5 TNF-connected genes and 2 TGFβ-related genes. These results suggest that the env+ cells were most likely responding to an infectious agent, and support the hypothesis that a viral infection may play a role in breast cancer pathogenesis. We and others [1–4] have shown that 37 to 41% of sporadic breast cancer samples contain MMTV-like env gene sequences. The sequences are expressed as RNA  and as protein in breast cancers (Melana et al., submitted). They are absent from the normal breasts of patients with env positive tumors  and are expressed as RNA exclusively in the cancer cells . The whole proviral structure, designated human mammary tumor virus (HMTV), which has 95% homology to MMTV, can be detected in two tumors . Although sequence variations are observed in the C-terminal of human sag sequences, the cloned human sag sequences expressed in human B lymphocytes can activate human T-cells, as can the mouse Sag, indicating that it can be functional . Moreover, viral particles with the morphological characteristics of betaretroviruses are observed in primary cultures of human beast cancer . Taken together, these results suggest that an infectious agent is present in some human breast cancers. Chronic inflammation has been implicated in tumor progression. New evidence suggests that the inflammation caused by certain viruses results in cancer [Reviewed in ]. Recently, it was reported that childhood lymphoblastic leukemia, as well as breast and ovarian cancers express an interferon-related signature, but not found in other human cancers studied . This finding provides molecular support for the role of inflammation or viral infection in cancer pathogenesis . The established breast cancer cell line MCF-7 is widely used in research, and many subclones are available. Some of the original isolates produce retroviral-like particles . Furthermore, May and Westerly  described the presence of an MMTV-like 6.6 Kb EcoR1 fragment in some of the MCF-7 cell lines, which was absent in other breast cancer lines and in normal tissue. Continuous passage with subsequent chromosomal change  may have eliminated viral sequences from some of them. It has been reported that some sublines of MCF-7 show biological differences  and significant genetic variation in RNA expression [17, 18]. We have previously reported that a subline of MCF-7 containing env and LTR sequences [19, 20] and that it expressed the env gene as RNA , while other sublines were negative for env gene [ and our own results]. To find out whether the presence of viral sequences is related to an interferon-related signature, we have compared the expression profiles of two sublines of MCF-7 , one which contains the MMTV-like env gene sequence (env+) and one which lacks it (env-). The presence of the Env protein was investigated in both sublines. In Fig. 1 the result of the immunoblotting experiment is shown. The HMTV env+ cell line expressed a protein of a MW of approximately 50 kD which reacted with mAbP2, a monoclonal antibody against a synthetic peptide derived from human env sequences (Melana et al submitted). It was absent in the HMTV env- cells. Tubulin was equally present in both extracts. Western blot of MCF-7 cells. Experimental conditions as described in Materials and Methods. A: MCF-7 (+) cells; B: MCF-7(-) cells. The results of the cDNA arrays are shown in Tables 1 and 2. Nineteen genes showed a > 2.5 fold difference in their adjusted intensity between HMTV env+ and env- cells, while another eight genes were only expressed in the HMTV env+ cells (Table 1). Twenty genes were downregulated (Table 2) in HMTV env + cells. Taken together, there were 47 differentially expressed genes. Among the 27 upregulated genes there were six interferon-inducible ones: IFI6, TRIM22, IFITM1, IFITM2+IFITM3, IFI27 and IP-30 and a receptor IFNGR2. In addition, there were five upregulated genes that have a connection with TNF or are involved in its signaling, like LTBR, TRAF3, MMP17, PKN1 and MAPK13. The cytokine TGFβ, and its downstream effector early growth response protein 1 (EGR1), were also upregulated in env+ cells. Twenty genes were down regulated in HMTV env+ cells. Comparison of the expression profiles of sublines derived from the same cell line provides an excellent model with minimal differences. Karyogenetic analysis revealed that the two sublines have similar complex chromosomal patterns (not shown). The comparison of expression profiles of MCF-7 env+ and env- cells indicated preferential expression of interferon-related genes: 26% (7/27) of the up-regulated genes. These differences may indicate a trend. Einav et al. have reported that 40% of clinical breast cancer samples display an interferon-associated signature; 17 out of 36 (47%) of the upregulated genes. Our results are consistent with, but cannot be directly compared with those of Einav's for several reasons: we used only one cell line for analysis, the participation of stroma and surrounding tissues has been eliminated from our study, and finally, we used a different set of arrays. Nevertheless, our results strongly indicate that HMTV env+ MCF-7 cells express more interferon-related genes than the HMTV env- MCF-7 cells, suggesting that they may be responding to an infectious agent as proposed by Einav et al. . The expression profile of HMTV env+ cells suggests an increased potential for cell growth, a fact that may be related to their more malignant phenotype as has been described in breast cancer cells associated with HMTV [23, 3, 24]. It is remarkable that the alpha 7 and beta 4 integrins were significantly down regulated in env+ cells, as has been reported in a set of finite life-span metastatic breast cancer cells which were also env+ . Whether the HMTV works as initiator and/or as promoter of malignant growth is uncertain. Molecular evidence that HMTV expression is responsible for the increase in interferon-related expression is being sought. The results clearly indicate that the transcriptional profile of the cells expressing HMTV sequences is enriched in genes involved in inflammation process. This finding is significant because it was obtained comparing cells derived from the same cell line that have similar genetic background and minimal expressing differences. This supports the hypothesis that a viral infection may play a role in breast cancer pathogenesis. MCF-7 cells were obtained from American Type Culture Collection (ATCC) and were propagated in vitro as recommended by the provider and as described in previous publications (1, 5). To determine whether the viral protein was expressed in our MCF-7 cells, western blotting was used. Protein lysates were prepared from approximately 1 × 107 cells. Equal amounts of protein from each sample were loaded onto an SDS-PAGE-10% polyacrylamide gel, followed by transfer to PVDF membranes. 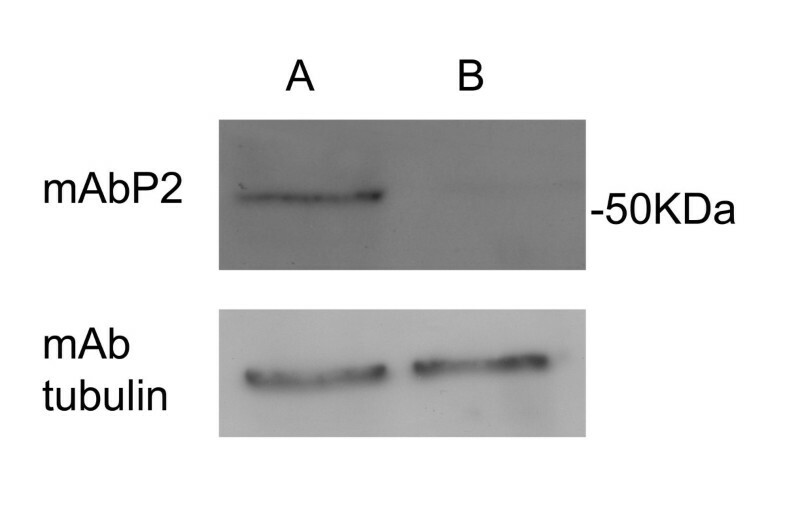 Western blot analysis was performed using mAbP2 (a monoclonal antibody against a peptide of the Env protein), and mAb-tubulin as primary antibodies (Sigma Aldrich). Proteins were visualized using horseradish peroxidase-labeled sheep anti-mouse IgG (GE Healthcare Bio-Sciences Corp.) as a secondary antibody followed by enhanced chemiluminescence (GE Healthcare Bio-Sciences Corp.). The expression profile was studied using the Atlas Human Cancer 1.2 cDNA expression array; a nylon membrane printed with 200–600 bp long fragments of 1176 characterized genes involved in cancer, 9 housekeeping genes and 6 negative controls (Clontech, CA). These conditions were described in detail in a previous publication . Briefly, RNA was extracted and labeled with Atlas pure total RNA labeling system and hybridized to an Atlas Human Cancer 1.2 cDNA expression array (Clontech, CA) according to the manufacturer's instructions. Both cell sublines were probed twice in separate assays, and the accuracy of each duplicate was assessed by Pearson's correlation coefficient based on the adjusted intensity of all genes spotted on the membrane. Hybridizations with 30 μg of total RNA were performed according to the manufacturer instructions. The hybridized membranes were exposed onto a phosphorimager screen and were read using a phosphorimager reader (Molecular Dynamics). The scanned images were aligned and analyzed using AtlasImage 2.01 software (Clontech). When averaging or comparing samples, the adjusted intensity signal was normalized using the global normalization mode featured in the software. We reported only those genes whose ratios of differential expression were 2.5-fold or more, or genes that were undefined for one type of sample, but were detected on the other. (Undefined genes are those whose intensity were below the signal threshold) In the later event, when we lack a numerical value for the ratio, it was defined as being "up" or "down". Furthermore, for each gene we stated the difference (diff) in adjusted normalized intensity between the two cell lines. Accession number (Acc#), gene symbol and protein or gene name are according to GeneBank. Grant support: The T.J. Martell Foundation for Leukemia, Cancer and AIDS Research, The Jane Grinberg Memorial Fund, the Kash Family Foundation, and the Ellen Block Memorial Fund. We thank Cindy Hernandez for skillful technical assistance and Jennifer Hasa and Julia Roboz for editorial work.